In the previous chapter we have learnt if-else statements in C and different operators and expressions. 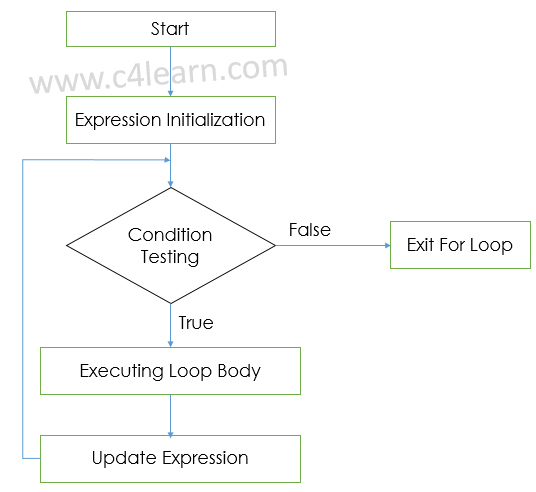 In this tutorial we will be learning more about C Programming for loop. Whenever we need to execute certain action multiple times, we need to wrap programming statement in the loop body. In the above program we have printed the string C Programming for loop 5 times. We will get better idea after looking at above for loop flowchart. Firstly the for loop executes the initialize statement in which the subscript variable will be initialized with the initial value. After updating subscript variable control again goes to execute condition statement. 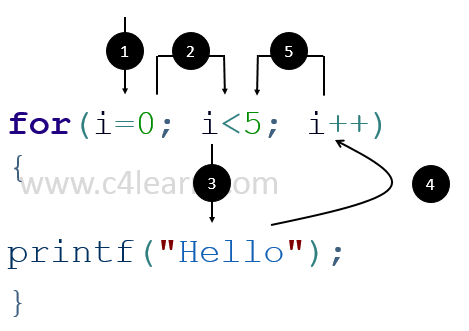 For single line of code – Opening and closing braces are not needed in c programming for loop. There can exist for loop without body. Initialization , Incrementation and Condition steps are on same Line.